Eight-year-old Hans A. Reyerback loved to visit the zoo. He would imitate the sounds of animals, and loved to draw the animals. After serving in the German Army (WWI) he traveled to Brazil where he wore a broad hat and watched monkeys along the Amazon. Margaret Waldstein loved art and studied photography. When Hitler came to power, life changed in Germany so she eventually traveled to Brazil. She was seeking new work and adventure and had heard that an old family friend (Hans) was living in Rio. They teamed up as artists, eventually married, and traveled to Paris. They planned to visit for 2 weeks; they stayed for 4 years. In 1939 they began working on a story about a very curious monkey. That year war broke out. Paper was scarce and typesetters had joined the army. And war was marching closer! They had to flee Paris on bicycles, sleeping in barns, and narrowly escaping the bombing. As refugees, waiting for visas, they were questioned by officials: what were the papers they were carrying? Were they spies? 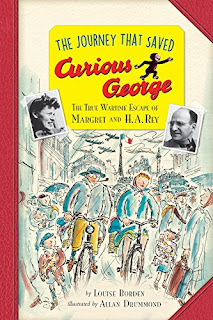 No, just writers.... Four months later they arrived in New York City and after another year they published the first book of many about Curious George. What I like about this book: Adventure! Danger! Escape from Nazis! and Curious George! It's got history and mystery and biography all rolled into one exciting story.